Experienced Plumbing Company Serving Livingston, Parsippany, Summit & Nearby! Plumbing is important, but we don’t necessarily appreciate this importance until something goes wrong. Suddenly there’s no hot water. Pipes freeze, crack and begin to leak. A toilet clogs and overflows all over the bathroom. At Pipe Works Services, Inc., we never lose sight of plumbing’s importance to homes and businesses. Our aim is to respond quickly to our customers’ needs, to provide reliable service for a fair price, and to offer the best products and technology available. No job is too big or too small. If you need a leaky faucet fixed, we're the company to call. 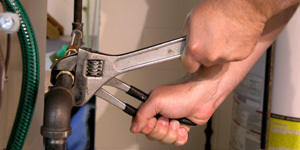 Pipe Works Services, Inc. can also handle major plumbing jobs and emergency plumbing needs. We respond to every job with the same level of urgency and professionalism. We provide estimates in Parsippany, Summit, Livingston and nearby for all plumbing and drain services. Give us a call at 1-844-884-5409 or contact us online today! "Very good service, quick response and attentive employees"
"Alan was great. Really appreciate his help. ..."
"I have been and continue to use "my plumbers" for a wide..."
"I have used Pipe Works now for a multitude of jobs from..."
Because you don’t know when a plumbing emergency will occur, Pipe Works Services, Inc. has crews available 24/7. Our technicians have the experience and equipment to tackle just about any kind of plumbing disaster. But we’re also the contractor to call when you’re planning to remodel, upgrade or build new. In these less-urgent situations, we can collaborate during the design phase, making you aware of products and details that can help you achieve your goals. Contact us for a no-obligation, price quote for any of our plumbing services. We serve many areas of New Jersey, including Livingston, Parsippany, Summit and Florham Park, Basking Ridge, Short Hills, Millburn, New Providence, Millington, Berkeley Heights and surrounding areas.